The Fyie & Rice Law Office LLC Monday Night Golf League begins May 13th at the Fairfield Public Golf Course. League dues are $20 per player, and they do not include green or cart fees. A 2019 USGA Handicap Index is also required. A sign-up sheet is located outside the pro shop, and all costs must be paid by 5:30 on May 13th. Four people were booked in the Wayne County Jail yesterday afternoon and this morning. 35-year-old Jeremy D. Wilson turned himself in on a Missouri parole warrant, 43-year-old Shane D. Proctor was arrested on a Warren County warrant, and 41-year-old Kent M. Harper and 37-year-old Brenda E. Fond were arrested on failure to appear warrants. According to a weekly crop report from the USDA, for the week that ended on April 7th, the statewide temperature was slightly over normal and precipitation was below average. Winter wheat condition was rated five percent very poor, eight percent poor, 32 percent fair, 50 percent good, and 5 percent excellent. The Marion Veterans Medical Center will be the home for several days of “The Moving Wall.” The wall is a half-size replica of the Vietnam Veterans Memorial in Washington, and it will be on display in Marion from May 2nd through the 5th. It is inscribed with over 58,000 names of those who died in service during the conflict. The City of Fairfield was recently awarded a grant for its Wastewater Treatment Plant, and it is in the process of applying for another to help with a water tower replacement project. The new grant proposal is due by midnight Thursday, and city officials will know if it was selected later in April, which would necessitate a presentation in May. The Fairfield City Council will meet tonight at City Hall with a three-item agenda. Aldermen will hear an update on a community program for economic development, and Mayor Maguire said he is planning a press conference for next Thursday at City Hall to provide more details. The conference will be held at 10 a.m.
Wabash Area Development, Inc., the local Community Action Agency, has announced the winners of the 2019 Wayne County Family of Distinction. 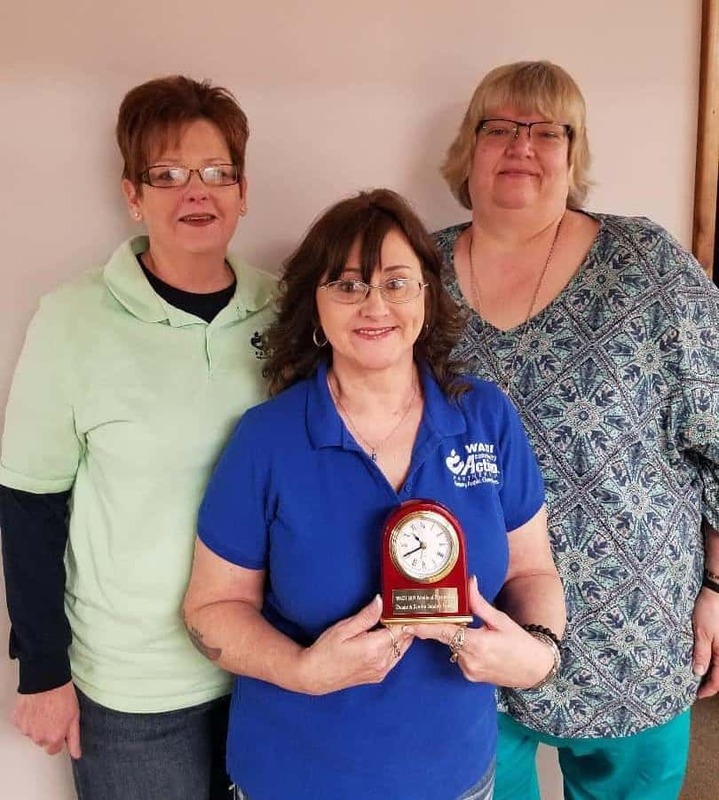 The family of Cisne residents Duane and Sandra Sanders were honored recently for exemplifying community action with the presentation of a mantel clock. The Jasper, Geff, New Hope, and Fairfield Public school districts will conduct Child Find/Preschool Screenings tomorrow, Thursday, and Friday. The screenings will be held at the First Christian Church and are for children who are not eligible for kindergarten. Parents should call 842-6501 to make an appointment. Planting season will soon be ramping up in Illinois, and that means pest season is not far behind. Kelly Estes, State Agricultural Pest Survey Coordinator, says there is some variability in tracking the pest game in the state, and some of that has to do with weather conditions. She says pest monitoring traps are being sent out to cooperators throughout the state. A bill that would ban colleges from asking applicants about their criminal history would hurt campus safety efforts, according to various police chiefs at Illinois universities. However, the bill’s sponsor, Mary Flowers of Chicago, said there is no proof that including the question actually improves safety. She further stated that those who have served sentences have already paid their debt to society. River stages as of this morning: Little Wabash, east of Fairfield stands at 22.33 feet, above the 17 ft. flood stage. Meanwhile, the Skillet Fork at Wayne City has a reading of 6.82 feet (flood stage is 15 ft.). The Little Wabash below Clay City is at 10.12 feet (flood stage is 18 ft.).